It's hard not to grow giddy at the thought of millions and millions of dollars, even if the money isn't yours. As Harold and Helen Lerner pulled into the driveway of their two-story English Tudor home in Rutherford on Friday afternoon, just a few hours after announcing to the world that they had won the $258 million Mega Millions jackpot, Michele Luna, who lives across the street, couldn't help herself. "They're home, they're home!" she exclaimed, trying to quiet her two children, who were, at this point, tired of waiting for their newly rich neighbors. "Oh my God, they're home!" she said. "Wow!" It was much the same at a news conference earlier in the day at Seton Hall University in South Orange, Helen Lerner's alma mater. The mood at Bishop Dougherty Student Center was ebullient. More than a dozen television cameras faced the stage. More than 100 people - friends, school officials, reporters and who knows who else - gathered to wait for the big announcement. There might as well have been helium balloons floating and champagne all around, the way people couldn't help themselves from smiling. Friends of the Lerners must be funny and charming raconteurs, judging from the way reporters laughed and smiled as they scribbled down their jokes and stories. Even Monsignor Robert Sheeran, president of Seton Hall, could barely contain himself. "I know that God is good," he said. "But sometimes God is very, very good." When the time came, husband and wife stepped into the spotlight. She wore a conservative navy blue pantsuit and he sported a double-breasted gray suit with a blue shirt and shiny tie. "It's just such a wonderful thing that's happened to us," Helen Lerner said. "Thank you, New Jersey. Thank you, Yogi, for selling us that ticket," she said, referring to Yogendra R. Patel, owner of the Leprechaun News convenience store in Rutherford. Helen Lerner purchased the winning ticket at the store on Sept. 15, the day before the Friday night drawing. Harold Lerner recounted receiving a phone call from a friend last Saturday morning. Someone in Rutherford had bought the winning ticket from Yogi, the friend said. Lerner knew it wasn't him. But his wife wanted to check The Record. She had bought a ticket for the gigantic jackpot. "Right on top of the newspaper were the numbers," Harold Lerner said. They double-checked the numbers about 500 times, he said. They were 5, 16, 41, 46, 50 and Gold Mega Ball number 1. "I'm thinking to myself this can't be right. This can't be real," Harold Lerner said. They decided not to tell anyone until it was official and stashed the winning ticket in her lingerie drawer. Then they went for a walk around town, where residents were still buzzing about the lottery win. On Monday, a longtime family friend who is an attorney accompanied them to lottery headquarters to start the claims process. Since Helen Lerner chose the cash option, they will get a total of $156.1 million, before federal taxes take about one-fourth of that, lottery officials said. 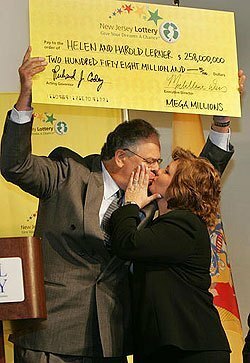 Helen Lerner said she plays the lottery only when the jackpot exceeds $100 million. The couple said some of their winnings would go to help Hurricane Katrina victims, as well as to Seton Hall University, where Helen Lerner was graduated in 1976. Harold Lerner said that both he and his wife came from hardworking families. She grew up in South Jersey, living at different times near Vineland and in Ocean City, and he grew up in Brooklyn. The Lerners want to keep their feet on the ground, they said, though they acknowledge they will indulge themselves a little bit. Harold Lerner yearns for a yellow checkered cab with jump seats in the back, which he remembers as a common sight from his childhood. He said he would like to drive to his childhood school and play stickball in the yard. Oh, and he's quit his job - a nice thing to do at age 60. As a self-employed salesman selling pots, pans and other kitchenware, he said, the process of telling his boss he was quitting was pretty simple. "I am the boss. I'm self-employed. I had a conversation with myself," he said, to generous laughter. Helen Lerner quit her job in sales for a drug wholesaler Tuesday. The Lerners have two grown children, but want to protect them from the spotlight. In the years before winning the biggest lottery jackpot in New Jersey history, the Lerners hadn't won much - just a couple of Yankee tickets and maybe a turkey from ShopRite. "We're just regular guys," Helen Lerner said. "It's hard to fathom what to do next." The Lerners plan to stay in Rutherford, where they have lived for 12 years. Just down the street from their house, Tom DiMeola was marveling that the day before, Harold Lerner had asked him to mow his grass. He had hurt his back, Lerner said, and none of the landscapers he'd called wanted the job. DiMeola agreed. When Lerner asked how much he wanted, DiMeola, whose mother lives on the street, said not to worry, that he was happy to help out. Lerner insisted on giving him two Andrew Jacksons, though. DiMeola plans to frame the two bills - for good luck.